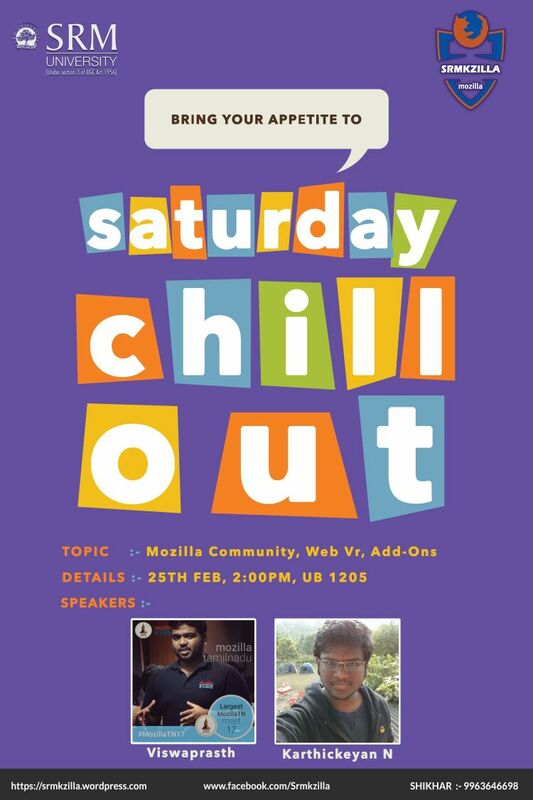 In the 3rd successful instalment of the “Saturday Chillout” the participants, primarily members of the club were officially introduced to the Mozilla TamilNadu Community by active members - Viswaprasth and Karthickeyan. Viswa elaborated on the importance of the open web and the various outlets by which we can contribute and more importantly learn. He explained how the things we contribute to the web like fixing bugs and user tests is essential in the big picture and helps learning better . He also guided us as to starting open source in mozilla from the scratch. He also shared his experiences with the same.Beyond this point, Karthic took over starting by explaining the history of how mozilla fought against proprietary software past the decade and how that war is still existent but on a different front - Mobile Software and applications. That is why WebVR is so important in his opinion, Virtual Reality that can be conceived in the open platform of the web, easily accessible by any browser by anyone. Mozilla made the development of WebVR much simpler with them making the open source software -AFRAME. Karthic then walked us through the basics of AFRAME and how easy it is to contribute and learn. The session ended with us connecting with Mozilla Community TN on the Telegram App. This is just the dawn. Stick around and stay tuned for many more forthcoming #SaturdayChillOuts.